BEARDED LADY + COLA 7% 250ML CAN 4PK - PLUS 1 FREE CAN! 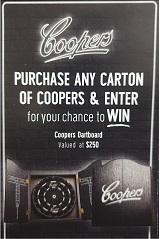 - GO INTO THE DRAW TO WIN A CAMPING CHAIR! BEARDED LADY 10% AND COLA CANS 4PK - GO INTO THE DRAW TO WIN A CAMPING CHAIR! BEARDED LADY 8% AND COLA CAN 4PK - GO INTO THE DRAW TO WIN A CAMPING CHAIR! BEARDED LADY CHARRED MOONSHINE 500ML - GO INTO THE DRAW TO WIN A CAMPING CHAIR! BULLEIT AND COLA 6% CANS 4PK - PLUS 1 CAN FREE!